Physics is the branch of Science that explains us all about matter and energy. This is an important branch as our everyday life includes physical activities which knowingly or unknowingly incorporate the applications of physics. Fluid Mechanics is the branch of Physics which deals with the study of fluids at rest or in motion, and also explains the behavior of fluids with solids and with other fluids. Fluid Mechanics is further divided into 2 important branches known as Fluid Statics and Fluid Dynamics. a) Hydrodynamics: The study of motion of fluids that can usually be approximated as incompressible (such as liquids, or gases at low speeds) is known as Hydrodynamics. Hydraulics comes under this section where liquid flow in pipes and open channels are studied. b) Aerodynamics: The study of the flow of gases over objects such as automobiles, aircrafts, or rockets at high or low speeds is known as Aerodynamics. c) Gas Dynamics: The study of the flow of fluids that involves changes in fluid density is known as Gas Dynamics. d) Meteorology, Hydrology and Oceanography involve the study of flow of the fluids that occur in the atmosphere, on Earth or in the oceans and seas. Fluids are substances that deform continuously (have no fixed shape) under the influence of external pressure. Since liquids and gases have such a property of deforming or changing shape even by the slight application of pressure, they are known as Fluids. Therefore fluids are classified as the substances that are in the liquid or in the gas phase. i) Stress: This is defined as the Force per unit Area. Stress is also referred to as ‘Pressure’. The maximum amount of stress a material can tolerate before it breaks is known as the ‘breaking stress’. The standard unit of Force is taken as ‘Newton (N)’ and Area in ‘m2’ and hence Stress is measured in N/m2 or Pascal (Pa). ii) Normal Stress: The normal or perpendicular component of force acting on the surface of the substance is known as the Normal Stress. iii) Shear Stress: The tangential component of force acting on the surface of the substance is known as the Shear Stress. This implies that here the force acting on the substance is parallel to the surface of the substance. The fluids at rest have zero shear stress, and therefore only normal stress is considered in this case. a) In liquids, molecules move relative to each other but the volume remains constant. This is because of the strong cohesive forces present in between the liquid molecules. Due to this property of liquids, they take up the shape of whichever container they are placed in. For instance, if a liquid is placed in a regular bottle, it takes up the shape of the bottle. If the same liquid is poured into a huge vessel, it takes up the shape of the vessel. b) Unlike liquids, gases do not have the property to take up the shape of the container. Due to weaker cohesive forces in between the gas molecules, they occupy the entire available space. Gases have the property to spread and expand, until they encounter the walls of the container. 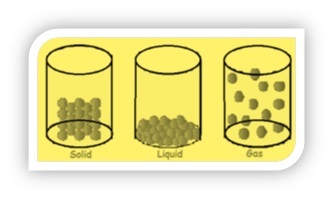 c) Liquids have the property of forming a free surface when placed in a large open container, as shown in the figure below. d) Unlike liquids, gases do not form a free surface when placed in an open container. They have the tendency to expand and thus occupy the entire available space. e) The molecules in a solid are tightly packed together and are arranged in a pattern thus forming a rigid shape as shown in the figure above. The liquid molecules are not as tightly packed as solids. Liquids molecules have the opportunity to translate (move in straight directions) or rotate. f) Unlike both solids and liquids, the gas molecules are usually placed far apart from each other and therefore gases do not have any shape. Due to this property, gas molecules do not have any pattern or ordering in between the molecules. Power plants, Boats and ships, Aircrafts and rockets, human body, automobiles, wind turbines, Plumbing system, industrial applications, natural flows and weather updates etc. 1) Viscous Flow: The continuous steady flow of fluids, where the effects of friction are significant. 2) Inviscid Flow: This is the type of flow considered for an ideal fluid in which no friction is considered. Viscosity is the measure of a fluid’s resistance to flow. An inviscid flow is considered to have no viscosity. 3) External flow: This is the flow of a fluid over any substance where the flow is not bounded by any material. 4) Internal flow: The flow of a fluid when bounded by some kind of material is known as the internal flow. The flow of fluids through pipes, ducts or any solid material is an example of internal flow. 5) Incompressible flow: If there are no significant changes in the density of the flowing fluid, then such a flow is known as the Incompressible flow. This implies that the density of the flowing fluid remains nearly constant though out its motion. Example of an incompressible flow is the liquid flow. 6) Compressible flow: If there are significant changes in the density of the flowing fluid, then such as flow is known as the Compressible flow. Compressible flows are usually observed to be flows with high-speed. Example of a compressible flow is the flow of high speed gases. Mach Number: This is a quantity which represents the ratio of the speed of the flow to the speed of the sound of that medium. Mach number is a dimensionless quantity and is extremely useful to analyze compressible flow in rockets, space crafts and various other systems that involve high speed gas flow. 7) Forced flow: When a fluid is forced to flow over a surface or through any pipe using external means such as a pump, or a fan etc, then such a flow is known as the Forced flow. 8) Natural flow: When there is fluid motion due to natural causes such as buoyancy etc, then that flow is known as the natural flow. 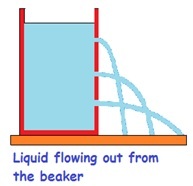 i) Laminar Flow: This type of flow is an ordered fluid flow which is characterized by smooth layers of the fluid. This flow can be generally observed in small pipes where in the velocity of the flow is less. Example: Highly viscous fluids such as oils, honey etc at low velocities typically move in laminar flow. ii) Turbulent flow: The fluid motion that usually occurs at high velocities and which is characterized by velocity changes is known as the Turbulent flow. Example: Fluids having low viscosity such as air when flowing at high velocities typically move in turbulent flow. iii) Transitional flow: The fluid motion in which both laminar flow and turbulent flow can be observed is known as the Transitional flow. Daniel Bernoulli, a Swiss mathematician and physicist has stated the principle describing the behavior of the flowing fluids. According to the Bernoulli’s principle, in the regions where the fluid pressure is lowered the fluid flow’s velocity is increased. Conversely, if the fluid pressure in a region is increased, then the fluid flow’s velocity decreases. This defines the inverse relationship between pressure and the flow velocity of a fluid. Bernoulli’s principle is a statement which comes as a consequence of the Conservation of Energy. Bernoulli’s principle is most importantly observed in the structure of an airplane. The wings of an air plane are constructed in such a way that it regulates the air on the bottom of the wing. This is achieved by constructing the top of the wing little curved, keeping the bottom of the wing flat. During an air flight, air blows concurrently across both top and the bottom of the wing. But because of the curved top part, the air on the bottom side of the wing moves slowly. According to Bernoulli’s principle, lower velocity of a fluid creates higher pressure. Therefore higher pressure is exerted at the bottom of the wing, whereas due to greater air velocity at the top of the wing lower pressure is generated on top. The higher pressure at the bottom of the wing helps create the lift for the airplane and allows the plane to fly. Bernoulli’s principle is used while sailing. It is not always true that the wind drags along the sailing boat in the sea. Many times the boat does not travel in the direction of the wind. In those situations Bernoulli’s principle is applied wherein just like airplanes, this principle is used in the construction of a sail boat. A sail boat has the keel constructed at its bottom so that maximum air flow is achieved by the low pressure created by the sail and this increases the speed due to which it lets the sailboat travel in the direction it has to. Bernoulli’s principle can be used to understand why a person is pulled towards a fast train moving towards him. A fast moving train creates a low pressure in between the person and the train, however the pressure on the other side of the person is greater. This greater pressure on the other side of the person is responsible for pushing the person towards the train. Hence it is highly suggested for people to keep a distance from an approaching train. Blaise Pascal was a French scientist and he has put forward the Pascal’s law which states that in an enclosed fluid at rest, whenever there is an increase in pressure at any point in that fluid, there is an equal increase at every other point in the fluid. This implies that an external pressure in an enclosed fluid in a container transmits equal pressure throughout the fluid in the container. Hydraulic systems are best examples of how Pascal’s law is applied in the real world. In a hydraulic system, pressure applied on one piston exerts equal amount of pressure on the other piston as well. 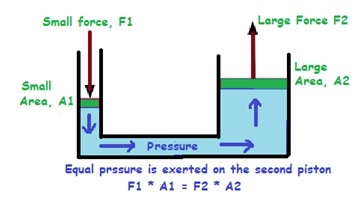 Now we know that Pressure is defined as the force per unit of the cross-section area. Pressure = Force/ Area ==> P = F/A. Here we can observe if the pressure is kept constant, then the Force applied is directly proportional to the Area. Now, in a hydraulic system we know that the pressure exerted will be the same on both pistons due to the principle of Pascal’s law. Therefore, if the area of the second piston is 10 times larger than the first piston, then the force exerted on the second piston also becomes 10 times greater than the force on the first piston. So therefore just by applying a small amount of force on the first piston, the second piston having larger area experiences greater force due to which it can be used to lift heavy objects. The diagram below illustrates this principle. Archimedes was an ancient Greek mathematician, and he is most famously known for stating the principle about the objects immersed in a fluid. According to Vitrivius (a Roman author), a golden crown for a temple had been made for the ruling King Hiero II. With no trust on the goldsmith, Archimedes was asked to investigate whether the crown was made of pure gold or whether any silver has been substituted by the goldsmith. Since the crown was to be offered to the Gods, Archimedes could not melt it or damage it any way in order to solve the problem. Vitrivius described that one day when Archimedes got into a bath tub as usual for a regular bath, he observed that the more his body sank into the water, more the water level rose in the tub. He then immediately realized that this effect can be used in order to determine whether the golden crown was indeed made of gold or not. Archimedes filled a large vessel with water to the very top and dropped a silver mass into it. The amount of water that overflowed was equal in volume to that of the mass of the silver that sunk into the vessel. Archimedes now refilled the vessel with water and this time he dropped a mass of gold into the vessel. He observed the amount of water that overflowed this time (since gold is denser that silver, the same weight of gold takes up less amount of volume). After refilling the vessel once again, Archimedes finally took the crown and dropped it into the vessel. He observed that more amount of water overflowed for the crown, than the amount of water that was overflown for the mass of gold. This implied that silver was added into the crown due to which the crown was less dense than that of just gold. It is said that Archimedes was so excited about this discovery that he forgot to even dress, and simple ran out of the tub naked to the streets crying “Eureka! Eureka!” (meaning “I have found it!’’’). Therefore, Archimedes clearly proved that the goldsmith was dishonest in making the crown. As a result of the above mentioned observation by Archimedes, the Archimedes Principle states that an object immersed in a fluid experiences a force known as the Buoyant Force, which is equal to the weight of the fluid it displaces. Buoyant Force: Whenever a rigid object is partially or completely immersed in a fluid, then the object experience an upward force that is equal to the weight of the fluid displaced. This upward force is known as the Buoyant Force. This can be understood by observing that the object has occupied the space that initially was covered with the fluid. Fluid pressure generates a net upward force and since the object is now immersed, the same upward force now acts on the object. The principle of buoyancy helps us understand how objects like boats, ships etc can float in water.